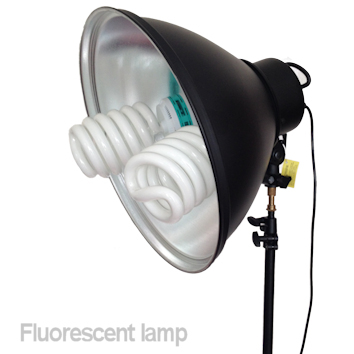 Cheap lights for Filmmakers - LED & Fluorescent. there are all sorts of different technologies to use. From old-fashioned tungsten to new-on-the-block LEDs. As these new lights become commonplace, so their prices will drop and they are already well within the reach of most film budgets. Prices, like the technology, vary greatly, however there should be a suitable light-source to match your budget. If you're starting out, chances are you're looking at the lower price ranges to start with. Let's have a look at a couple of cheap options, starting with LED. The quality of LED lighting is excellent and they're now widely used in the industry. 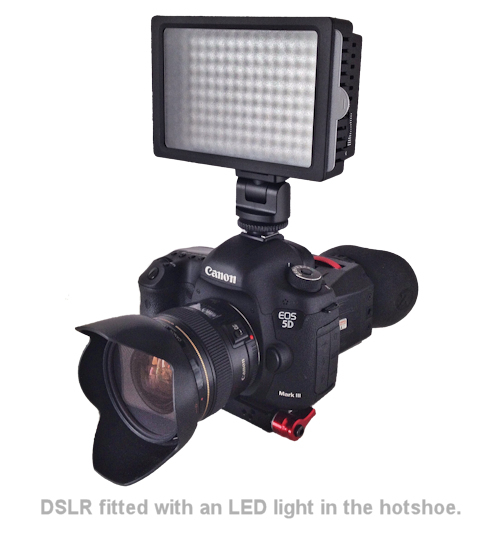 In our image here, you can see a very cheap LED light fitted to the top of a DSLR. This cost � from Amazon (not including camera!) It has an array of 160 LED lights and is powered by 6 AA batteries or a Sony Li-on NP series battery. The LEDs are covered by a swopable diffuser which can be changed for other colours depending upon the colour temperature you're working with. This light is quite powerful for illuminating fairly small scenes or perhaps if you were doing a head and shoulders interview. We've mounted it on the DSLR cold, (there's no connection between the camera and the light). It can be mounted anywhere there's a hotshoe, so on top of a light stand with an adaptor for instance. It's not powerful enough to be a main light but would be great as a hair light in an interview or as a fill light. LED lights come in a variety of sizes from small like this to large where there are a thousand or more LEDs in a panel. Obviously a light that big doesn't go on top of your camera, it would be fitted to a light stand. Another cheap option, fluorescent bulbs. Here we have a light stand fitted with a head capable of taking 4 bulbs. In this shot we have it fitted with only two. This light can be purchased for � with 4 bulbs. (Without stand). I purchased a couple of different bulbs as these have better daylight balance, which are � each. These bulbs give a nice quality of light and they don't get too hot in operation. One might be enough to light an interview maybe with that LED light as a hair light. Perhaps the only disadvantage is the need to have somewhere to plug it in for power. (All prices correct at time of writing only).